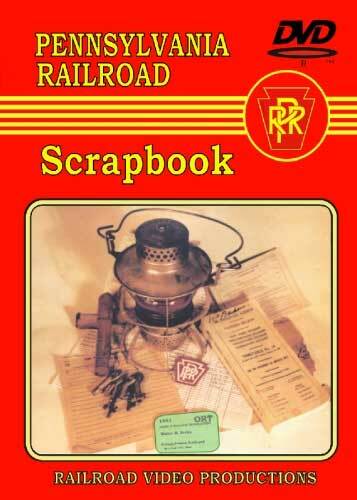 PRR scrapbook is dedicated to the memory of the PRR and it's employees. We begin in color (the 16mm film was shot by Robert Sage) with a brief look at the St. Louis area. We then move to the North-South main line between Washington, DC and Philadelphia for scenes shot from several different GG-1's as well as scenes from the rear of the train. We then board train 3307 powered by GG-1 4872 at Penn Station, NY for a "head-end" ride (in black & white) on the fireman's side all the way to South Amboy. Over 75 pictures of PRR employees are seen including Train Dispatchers, Movement Directors, Clerks, Leverman, Engineers, Firemen, Conductors, Breakman, Maintainers, Helpers, Janitors and more - all to help preserve the memory of the 'PENNSY'. 1 Hour Color and B&W. JL (Chicago) on 2018-11-23 08:02:01. This is actually a better DVD than I expected. The vignettes on the PRR employees was pretty cool. It looks like most were caught in candid shots so you get a real sense of what their jobs were like. The GG-1 cab ride that makes up most of the DVD was a surprise. First off, it was taken from the engineer's side, not the fireman's side as noted in the description. And it was also filmed in color, not B&W. But it was filmed in winter and between the all black GG-1 and the fact that Newark is pretty gray in winter, I used to live near there, I could see how some would think it was filmed in black and white. All of the stations are captioned so it's easy to know where you are too.